Documenting and sharing video evidence of how great white sharks behave when swimming through a kelp forest. 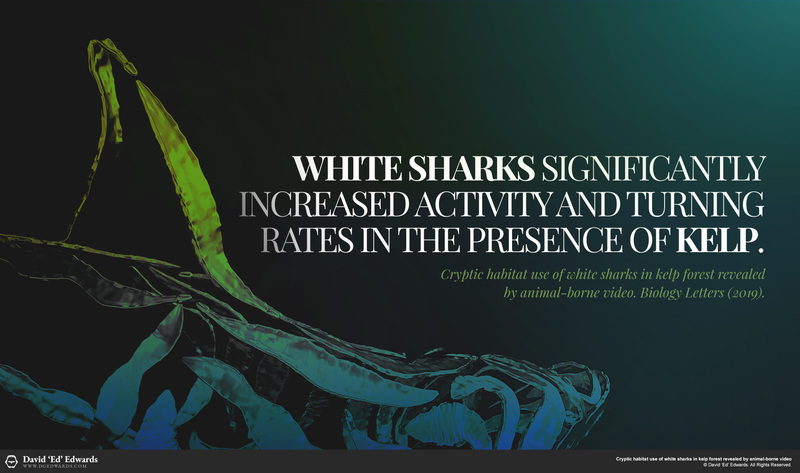 This is the first study to be published using data captured during the South African expeditions in white shark kinematics. We’ve captured a broad range of behaviours and interactions between white sharks, their environment and prey species such as fish and seals. In this particular study, we revealed their behaviour when swimming through a kelp forest near Dyer Island. Sharks were shown navigating these areas with relative comfort and ease, having it long be presumed that they outright avoided such environments. The paper doesn’t categorically prove that great white sharks hunt in kelp, even though they are shown following seals in there. While this strengthens the argument that kelp does provide refuge, it opens questions as to how shark may adapt their hunting strategies accordingly. I assisted with the process of attracting sharks to the boat, so that the underwater cameras and data loggers could be attached to their fins. I’ve analysed and logged a large portion of the data captured during these trips. I also produced promotional artwork and graphic designs, featuring a Steel Kelp Shark Culpture.